June 13, 2018, 7:01 p.m. But messaging apps are picking up the slack, the Reuters Institute for the Study of Journalism finds in its 2018 Digital News Report. By Laura Hazard Owen @laurahazardowen June 13, 2018, 7:01 p.m.
People are becoming disenchanted with Facebook for news. 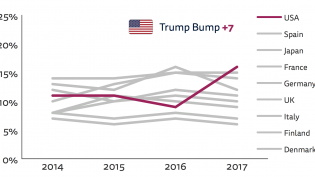 The “Trump bump” appears to be sustaining itself. 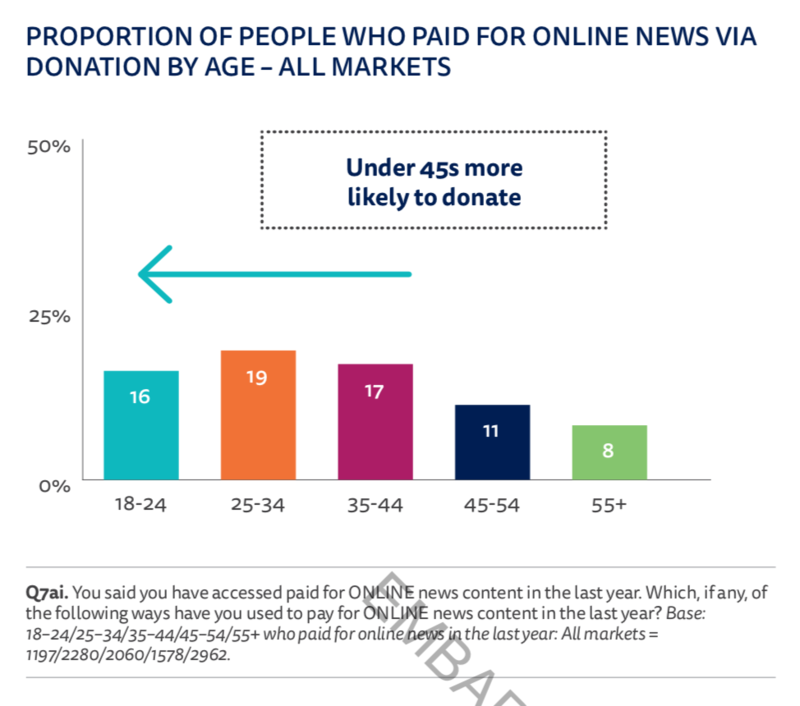 And younger people are more likely to donate money to a news organization than older people. 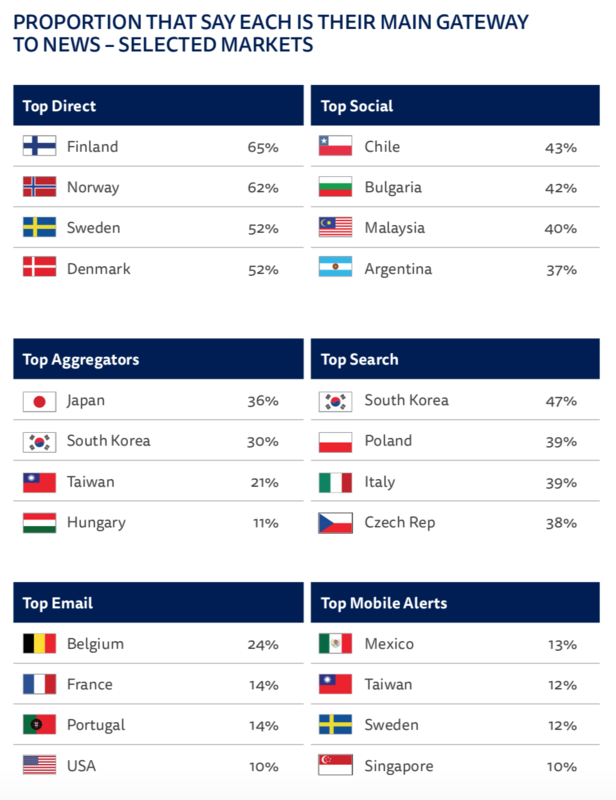 The research is based on online YouGov surveys earlier this year, followed by face-to-face focus groups in the U.S., U.K., Germany, and Brazil on the topics of social media and messaging apps. 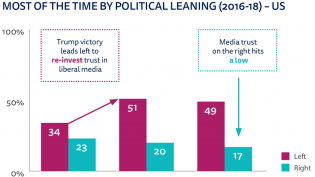 The report includes a number of findings on fake news, misinformation, and trust in the media; for more on those topics, see this piece by the report’s authors, and I’ll also include some more info in Friday’s fake news column. 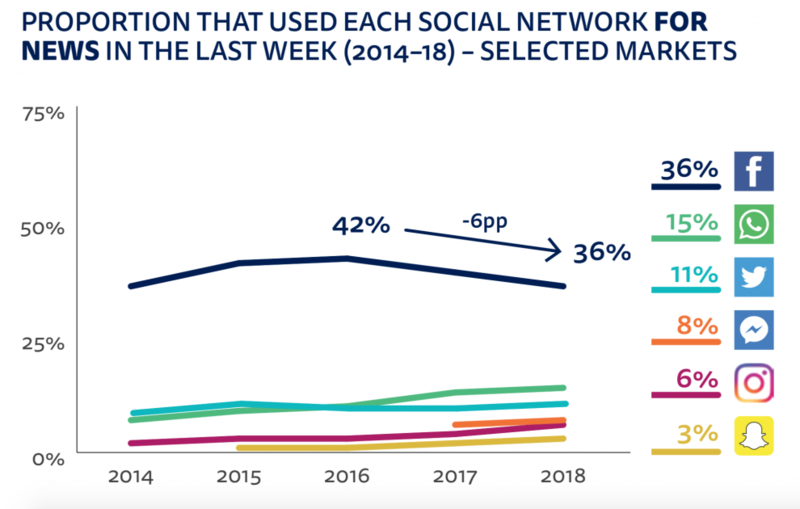 The use of social media (read: Facebook) for news is declining. News apps are making a comeback. More young Americans are paying for news. 2017 is weird. “For the last seven years we have tracked the key sources for news across major countries and have reported a picture of relentless growth in the use of social media for news,” the researchers write. “Now, in many countries, growth has stopped or gone into reverse.” This is almost entirely due to changes in Facebook habits. 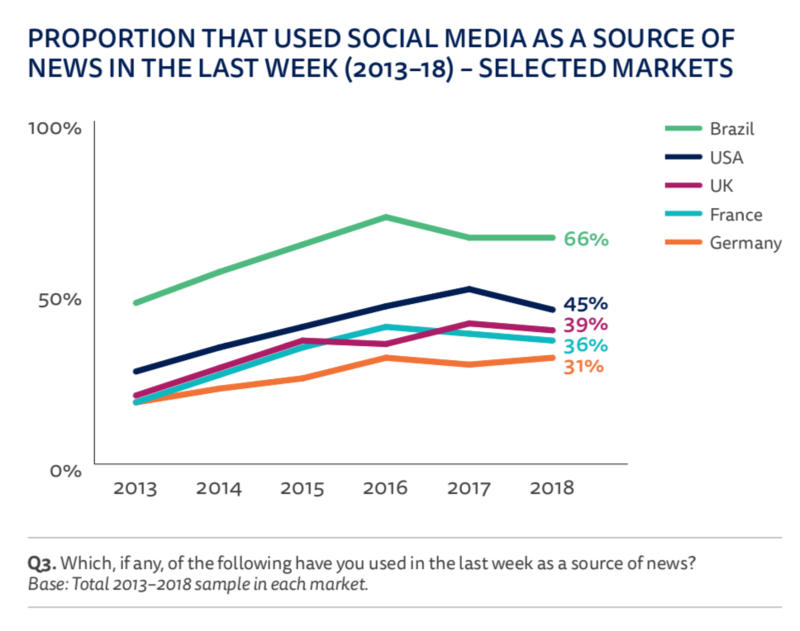 In the U.S., for instance, 39 percent of people said they used Facebook as a source of news in 2018, down 9 percentage points from 2017. And if you look just at young people in the U.S., their use of Facebook for news is down by 20 percentage points compared to 2017. This isn’t true in all countries — “Facebook news usage is up significantly in Malaysia and the Czech Republic — but it’s true in most of the ones Reuters looked at. This continues a trend that began last year in countries outside the U.S.
Reuters ran most of its research before Facebook’s algorithm changes in January 2018. 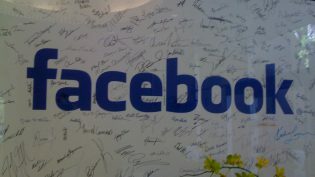 If this can’t be blamed on a decision by Facebook, then what does account for it? The researchers suggest that people feel more comfortable moving their discussions to closed messaging apps like WhatsApp (whose use for news across countries has almost tripled since 2014 — though, in the U.S., only four percent of respondents said they get news from it). [If] more immediate and intelligent discussion moves to messaging apps, this could make Facebook and Twitter comments even less representative of general users than they already are. People say they prefer “side-door access” to news. 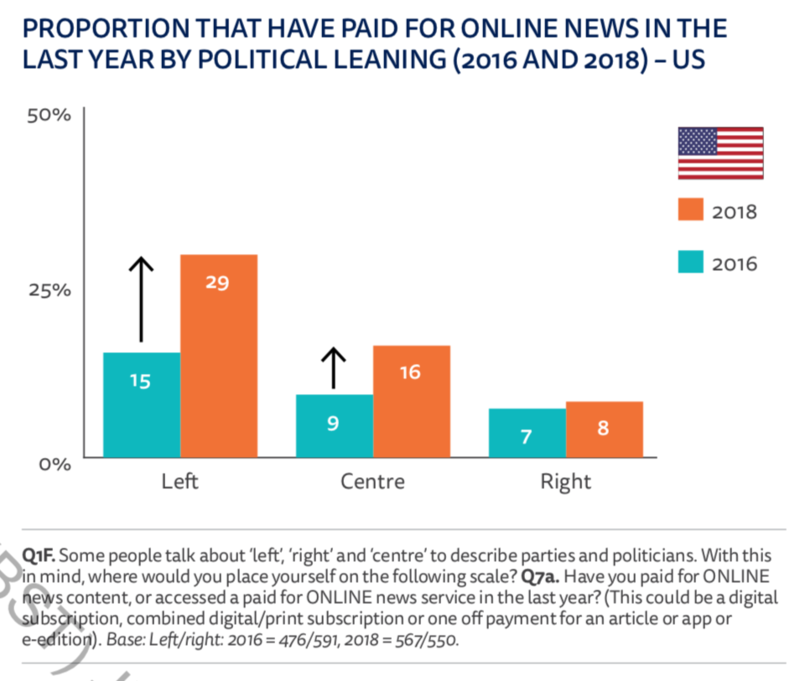 Sixteen percent of respondents in the U.S. pay for some kind of online news — with almost all of the growth coming from left-leaning people and people under 35. One of our new questions this year reveals that more than two-thirds of respondents (68 percent) are either unaware of the problems of the news industry or believe that most news organizations are making a profit from digital news. In reality, most sites are operating at a loss, subsidized by investors, alternative revenue streams, or historic profits from broadcast or print. 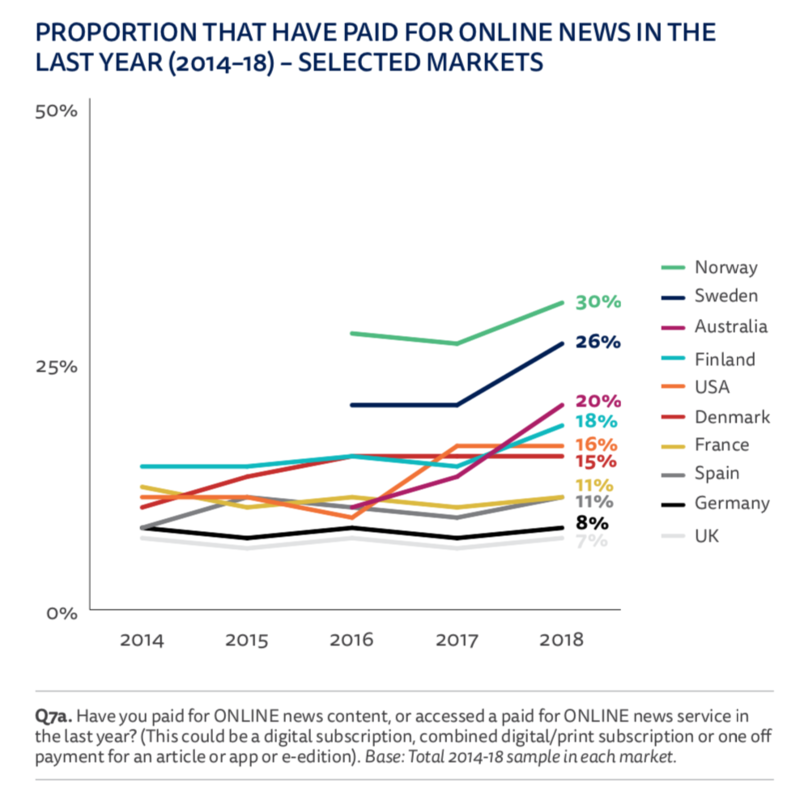 Those that were aware that digital newspapers are making a loss (10 percent of our sample) are more likely to pay for a news subscription or give a donation. Donations may help bridge the gap between paying nothing and an expensive subscription, but they also work better for a generation that likes to access multiple sources on multiple devices. For both these reasons we can expect pay-as-you-go models like donations and crowdfunding to be an increasingly important part of the picture. …but, in the U.S., news fatigue is real. The full report, which includes a ton of country-specific data, is here. POSTED June 13, 2018, 7:01 p.m.
Owen, Laura Hazard. "After years of growth, the use of social media for news is falling across the world." Nieman Journalism Lab. Nieman Foundation for Journalism at Harvard, 13 Jun. 2018. Web. 24 Apr. 2019. Owen, Laura Hazard. "After years of growth, the use of social media for news is falling across the world." Nieman Journalism Lab. Last modified June 13, 2018. Accessed April 24, 2019. https://www.niemanlab.org/2018/06/after-years-of-growth-the-use-of-social-media-for-news-is-falling-across-the-world/.